Coming into work after a beautiful weekend like we just had - is hard. It was truly a weekend where you didn't want to be in the house for any amount of time. 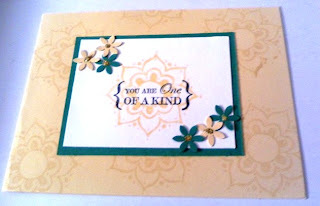 Here is a card I did recently for a swap. As I mentioned before, I have been participated in swaps to keep the creative juices flowing. I had to borrow this stamp set, but I like it enough, I might have to have it.